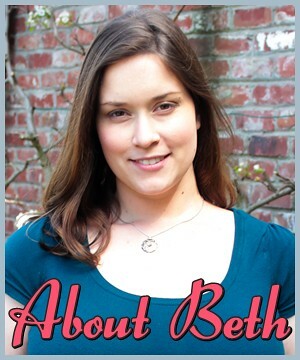 Some of my readers may know that I recently signed on with a great company – Beau-coup.com. Because of this, my blogging has been on the back-burner for a little bit. But here’s an update on what I’ve been up to! 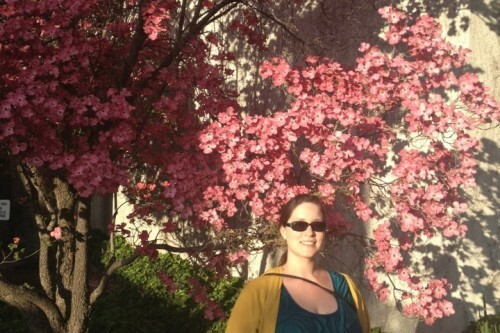 Knowing the next several months settling into my new job would be busy, my husband and I jumped at the opportunity for a mini-road trip this April. With only a few days to plan, we decided to drive up through northern California and into Oregon. My father and his wife had given us a National Parks Pass for my birthday last year. We’ve enjoyed using it locally for trips to Pinnacles and Muir Woods but our goal this time was to visit Crater Lake. Other than making sure we visited Crater Lake, we let ourselves be spontaneous and just focused on enjoying the journey. And what a journey it was! In all, we covered 1,500 miles in just 4 days. The variety of climates, natural beauty, tasty food and friendly people made this such a wonderful experience. 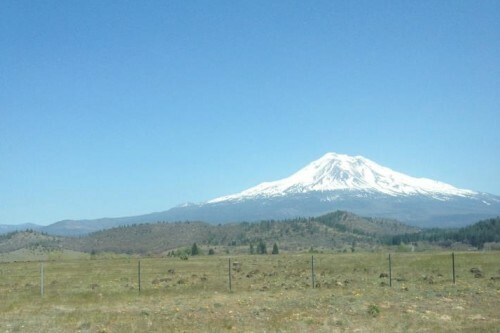 We started out bright and early on a weekday morning, making the long trek through the central valley, up past Mount Shasta and finally into Oregon. As a kid, I used to watch Mt. Shasta pass by on my way up to visit family in northern California. My Uncle owned a horse ranch with real draft horses. One thing we did this time (that I’ve never done before) was stop at Lake Shasta for a brief visit. 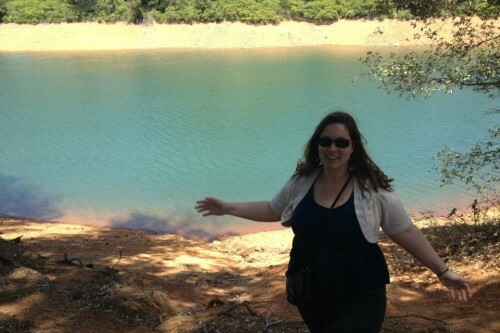 For the first time ever, we stopped at a local Shasta campground to spend a few minutes. I had never been so close to the lake before. The water was an iridescent, azure blue. Since it was a weekday, the campground was quiet, but there were dozens of woodpeckers in the trees and even a family with baby ducks. Once we’d had our fill of the Shasta campground (and vowed to return! 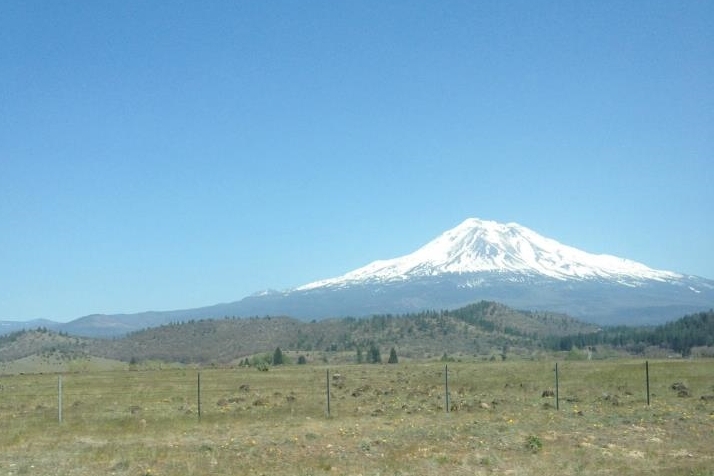 ), we trekked onward towards Northern Oregon. By the late afternoon, we pulled into Ashland, Oregon. 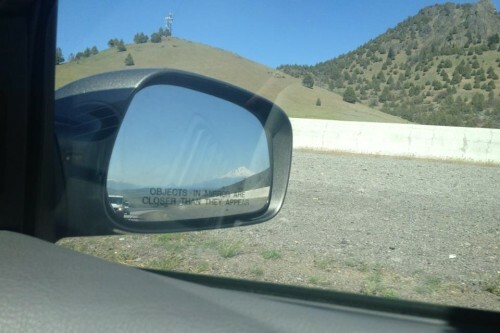 Mount Shasta in the rearview mirror. We spent our first night in Ashland, Oregon. During my childhood, I’d visited Ashland practically every year to attend the Shakespeare Festival. If you’re planning a trip to Ashland, I’d definitely plan ahead to get tickets to a show. This time we didn’t have a chance, unfortunately. However, we did spend a nice hour at Lithia Park, sitting by the burbling creek. What a relaxing place to unwind! Then I showed Jeremy around the theaters and downtown shops. Staying in Ashland was also our first time using AirBnB. We found a lovely cottage for rent at a steal of a price! I felt very “with it”, booking our room via my iPhone. Pink Dogwoods were in bloom all over Oregon! The show-stopper was definitely their Chocolate cake with Salted Caramel Ice-Cream. It was MY turn to lick the plate. The ice cream was housemade and positively fantastic. After a long day of driving, sightseeing and some great food, we were very ready to curl up for a good night’s sleep. Stay tuned for Road Tripping It – Day 2!